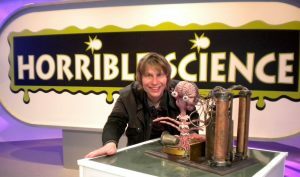 Calling all Horrible Scientists – here’s a rare chance to learn some gross funny Horrible Science experiments from the actual creator of the Horrible Science series – Nick Arnold! Why not try them on your friends and family – for extra-squishy fun? The best dressed mad scientists will win a prize! Places are horribly limited so book now! For more information about Nick Arnold and Horrible Science visit his website here. Recommended for ages 6-13, accompanying adults do not require a ticket.